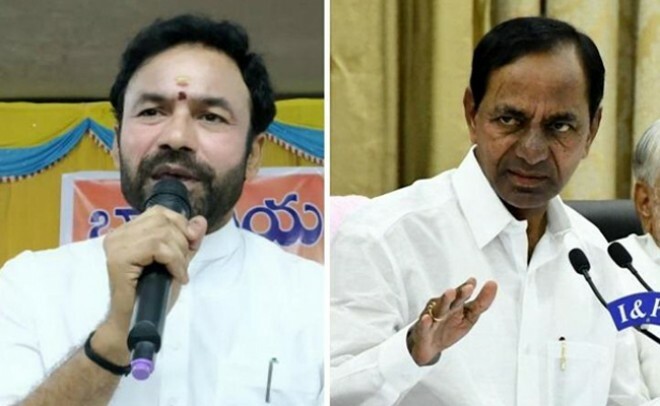 Hyderabad, Feb 20: Telangana Bharatiya Janata Party leader G Kishan Reddy demanded the SHE Teams of Hyderabad Police to book a case against CM K Chandrashekhar Rao for not allocating any ministerial representations to women in his cabinet. In this regard, Kishan Reddy alleged that CM KCR should be charged for discriminating against women. It is well known news that, The SHE is a special law enforcement and police team that is dedicated to the safety of women in Telangana. The SHE Team is an exclusive team which is the brainchild and initiative of KCR and the police of Telangana state. Yesterday, 10 ministers were sworn into KCR's cabinet and no berth was given to any women MLAs during this term as well. KCR's previous cabinet as well, did not comprise of any women ministers. During the assembly elections, four women had been given TRS tickets, out of which three won, namely former deputy Speaker Padma Devender Reddy, Ajmera Rekha and G Sunitha Reddy. During this cabinet expansion, KCR also failed to give representation to ST and tribal people in his cabinet. However, former Deputy Chief Minister Kadiyam Srihari told reporters that the next expansion would certainly have a woman and a legislator from the ST community.